Workshop participants discussed their perceptions of the growing sources of disorder in the world, examined areas of strategic cooperation, and explored where the United States and the European Union might work together to address a variety of regional concerns emanating from Africa, China, the Middle East, and Russia. While highlighting how the two can work together to address increasing political instability and violent conflict, participants also cited the importance of the transatlantic relationship in preventing or mitigating the demise of the liberal international order. Despite these concerns, participants identified four regions where the United States and the European Union could coordinate in areas of strategic interest to prevent conflict and potentially bolster the transatlantic alliance. Participants agreed that the long-term challenge from Russia is its ability to undermine Western unity, whether through disinformation campaigns, election meddling, or the use of limited war to transform the international system. As one participant stated, China is a threat because it is a rising power, while Russia is a threat because it is a declining power. Despite Russian aggression, participants agreed that the United States and the European Union should continue to hold dialogues and identified strategic arms control as one area of interest ripe for cooperation. Participants agreed that the United States and the European Union should remain in discussions with Russia on the New START and Intermediate-Range Nuclear Forces treaties. Participants also agreed that the United States and the European Union should adopt a unified approach to Russian cyber efforts, but acknowledged that the likelihood of reaching an agreement with Russia itself was slim. Participants agreed that China views global governance, trade, sovereignty, and human rights in a fundamentally different way than the United States and the European Union do, leaving opportunity for transatlantic coordination on areas of strategic interest. Unfortunately, participants also acknowledged that, given internal European politics and the Trump administration’s policies, it may be difficult for the United States and European Union to develop a cohesive China strategy. On trade, the United States and the European Union have been largely successful in advocating for stronger intellectual property protections, promoting market access, and coordinating pushback against laws and regulations discriminating against foreign entities. However, several participants noted that EU member states are divided in their response to Chinese investment and trade, as some EU states privilege short-term money flows over long-term consequences, thus making high-level U.S.-EU-China trade agreements difficult. With Chinese President Xi Jinping’s consolidation of power, participants noted that China has asserted sovereignty claims more firmly in critical areas, including Taiwan and the South China Sea. Participants noted that the United States and European Union agree on the strategic importance of Taiwan and the South China Sea, but differ in their approaches to both. The United States has made Taiwan an important component of its China policy, while the European Union has not. In the South China Sea, the United States and European Union do coordinate on freedom of navigation operations, but differ in the manner in which they exercise their rights. In terms of future cooperation, participants agreed that the United States and European Union should continue to challenge China on its human rights violations, hold Xi to account on China’s climate change advocacy, attempt to reach an agreement with China on internet governance (which may be difficult given divergent U.S. and EU views), and work with China to establish common standards and lending regulations for its Belt and Road Initiative. In the Middle East, participants agreed that the United States and the European Union share concerns over terrorism and the stabilization of Libya and Yemen, but diverge on approaches to Iran and the Joint Comprehensive Plan of Action (JCPOA), as well as the conflict between the Israelis and the Palestinians. Some participants also emphasized that, although the Middle East is geostrategically critical for EU security, EU member states do not follow a coordinated Middle East strategy. Moreover, several participants identified a potential flashpoint in U.S.-EU coordination in the Middle East over a possible Iran-Israel confrontation; they expressed misgivings over whether the United States and European Union would present a united transatlantic front in the face of armed conflict. Regardless, opportunities for cooperation exist and include counterterrorism initiatives and stabilization efforts across the Middle East, particularly in Syria, Tunisia, and Yemen. Participants flagged the Global Coalition to Defeat ISIS as an example of multiple consecutive U.S. and European administrations sharing best practices, intelligence, and labor. As postconflict situations emerge, participants agreed that the United States and European Union will continue to coordinate on regional stabilization, but that the United States is less likely to commit itself to any long-term reconstruction efforts. Identify areas where civil society and private sector actors can take the lead on contentious issues, including climate change. Pursue specific strategic areas of cooperation below the senior levels of government to maintain dialogue and ensure the pursuit of national security interests. Potential areas of cooperation include arms control agreements and counterterrorism efforts. Prepare for European strategic autonomy, despite internal European political disputes. 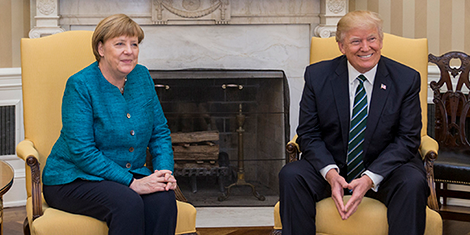 Though Europe is preparing for a post-American future, its efforts do not preclude the return of U.S. power. Empower the periphery: those actors who operate at the sub-state level. As societies grow increasingly interconnected, the traditional state-based framework may need to flex and allow for nonstate civil society actors to work on transnational issues. The Center for Preventive Action (CPA) aims to help policymakers devise timely and practical strategies to prevent and mitigate armed conflict around the world, especially in places that pose the greatest risk to U.S. interests. It accomplishes this by commissioning in-depth reports, convening meetings of experts, and consulting with representatives of international organizations, civil society groups, corporations, and the media.